The corporate world is in a state ferment and transition. There is at present a growing group of management thinkers and leaders who are seeking for something greater than the bottomline. Among them there are some who are talking about spirituality in business. However most of what is called as “spiritual” in management skims the upper layers of the mental and moral domains and falls short of the true spiritual domains of consciousness. This new thought in management can help the corporate world in taking the next step in evolution beyond the techno-economic bottomline and therefore helpful in the forward march of business. But to move further beyond into the spiritual, the corporate mind has to understand clearly the distinction between the higher mental-moral domains and the true spiritual dimensions. The main purpose of this study is to bring about this distinction between the new thought in management and the spiritual paradigm of consciousness. New thought in management (NTM); meaning of spirituality; spiritual paradigm of consciousness (SPC); difference between NTM and SPC; inner discipline for spiritual transformation of consciousness. Let us take some brief snapshots of the evolving corporate world. When we look back at the early seventies, the dominant corporate values are shareholder value, market-share, profit-maximization, productivity, and competitive advantage. Looking again after another ten or fifteen years, you see some new values like quality, customer service, innovation, knowledge-management, and globalization gaining prominence. Presently we see another set of values like social responsibility, sustainability, ethics, and employee development, slowly gaining increasing acceptance among corporate leaders. A new concept, which is popular at present among business leaders, is “triple-bottom line”: economic, social and environmental. What is the meaning and significance of this change or evolution in values? We can perhaps get some clues to answer these questions if we examine the corresponding or parallel evolution in terms of conception of human nature and motivation theories in management. According to Stephen Covey, evolution of management thought may be viewed in terms of four paradigms. First is the scientific-authoritarian paradigm of Fredrick Taylor, which viewed the human being as a physical man or a “stomach” seeking mainly for economic survival and security. In this paradigm, the path of motivation is through a system of punishments and rewards administered by an authoritarian management style. The second paradigm is that of the human relations school which conceived human beings as a “heart” with emotional needs for appreciation, recognition and affection. The path of motivation lies in treating people with respect, decency, courtesy and kindness. The third paradigm views the human being as a “mind” with its need for knowledge, self-expression and self-actualization. Here, the motivational strategy is based on providing sufficient autonomy and opportunity for people to develop and express their mental potentials and talents and harness them for realizing organizational goals. This is the paradigm of the human resource development. Thus, in terms of organizational development the highest conception arrived in modern management thought is the concept of the “triple bottom line” with an emphasis on Corporate Social Responsibility and Sustainability and creating value for stakeholders. And in terms of human resource development it is the principle-centred paradigm of Stephen Covey. There is a meaning and pattern behind this change and evolution of values and conceptions in business and management thought. Modern business has gone through a process of natural evolution from the physical-economic, social-emotional to the mental-moral paradigm. In our integral view Covey’s paradigm is not entirely spiritual; it is predominantly mental-moral, but it can be a very effective preparation for the spiritual. Emphasis on some universal moral principles like integrity, fairness, justice, kindness, service or contribution to the society. Harmonious relationship with people with an emphasis on family, friends, work-life balance. The integral view agrees with Stephen Covey that the next step in evolution has to be in the spiritual dimension. But as we have indicated earlier, in the integral view, most of this new thought in management are within the mental-moral domain and do not enter into the spiritual domain. In our further discussions we will call the new thought in management as the NTM paradigm and the spiritual paradigm as SPC which means spiritual paradigm of consciousness. Before coming to the differences between NTM and SPC we must have a clear understanding of the meaning of spirituality. Let us now examine this much misunderstood term, “spirituality” in the light of Sri Aurobindo’s luminous and insightful perspectives. Sri Aurobindo begins his elaboration of the meaning of spirituality by listing what spirituality is not, “It must therefore be emphasised” says Sri Aurobindo, “that spirituality is not a high intellectuality, not idealism, not an ethical turn of mind or moral purity or austerity not religiosity or an ardent and exalted emotional fervor, not even a compound of all these excellent things; a mental belief, creed or faith, an emotional aspiration, a regulation of conduct according to a religious or ethical formula are not spiritual achievement or experience.” We must note here many of these characteristics, aims or objectives of NTM come within this list of what spirituality is not. For example in the emerging literature in the West sometimes a strong vital “passion” for work is regarded as spiritual. But what is called here as passion belongs to what Sri Aurobindo describes as “ardent and exalted emotional fervor” in the list of what is not spiritual. NTM paradigm is confined to self-development within the mental-moral ego; SPC aims at self-transcendence of the mental-moral ego in an egoless and universal consciousness. NTM paradigm aims at a mental-moral reformation of outer behaviour and action; SPC aims at an inner transformation of consciousness. NTM aims at self-actualisation within the body-mind complex; the goal of SPC is self-realisation, which means discovery of the deepest and innermost truth of our spiritual individuality beyond our body and mind and live and act from this true Self. This true Self is at once individual and universal. It has an individuality with its own unique and intrinsic nature. But at the same time its consciousness extends to embrace others and all life in a feeling of spiritual identity, where we can feel all others as part of our own self, as concretely as we feel our body as our own self. If you ask how can something be at once individual and universal, we can only say that the spiritual domain transcends the categories of logical thinking; it is a consciousness in which contradictions of logic are fused in a suprarational harmony. NTM aims at meaningful work; the quest of SPC is to discover the highest aim, meaning and purpose of human life as a whole. In NTM, worldly success is an important and integral part of the goal; in SPC they are the result or a by-product and not the aim. In NTM, CSR is based on economic and social mutuality between the Corporation and the Community; in SPC it is based on the unity of consciousness where other are felt as part of our own self. Leading faculties of NTM are reason and ethical sense. In SPC they are the ethical aesthetic and intuitive intelligence. Preparatory inner purification through a process of cultivation-rejection, which means rejections of all thought, feeling, impulses and motives which are contrary to the ideal and cultivation of all that is in harmony with ideals. Progressive elimination of ego and desire from all the levels of our being—physical, emotional, mental, moral. Transcendence of dualities through the practice of equanimity to the polarities of life like success and failure, praise and blame, joy and sorrow. Witness-consciousness by which we can watch the inner movements of our mind and heart as a detached observer. Inner calm, peace and silence, which means freedom from the clamour thought. Development of the intuitive intelligence beyond the mind. Self-surrender to a higher divine power above our mind. All actions for and relationship with others have to be based on an experience, intuition, feeling or perception of the Unity-consciousness or I-am-You consciousness, which means on the perception, my wellbeing is dependent on the wellbeing of others and that of the larger whole of life, and when I do good to others I am doing good to myself and when I hurt others I am hurting myself. This principle of unity-consciousness applies not only to outer activities but also to our inner movements like thoughts and feelings. A good thought and feeling for others induces a similar thought and feeling in them leading to harmonious relationship. And conversely, negative thoughts and feelings like irritation, anger, resentment also invokes a similar reaction in others, leading to perpetual inner conflict which may not be visible outside. 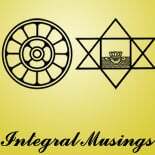 This entry was posted on June 21, 2014 by integralmusings in Integral Management.